First, take a deep breath, aahhhh, relax, make yourself comfortable, let the sunlight caress your skin as you absorb the magnificence of the Pacific, brilliant sun piercing the sky on a clear day and you do feel as if you can see forever. 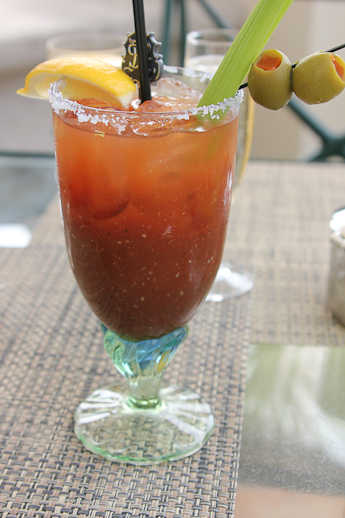 Begin with a flute of bubbly or the world famous St. Regis Bloody Mary and realize how lucky you are! Having been to the original St. Regis in NYC, there was no question that this gorgeous Sunday afternoon repast be ushered in with the famous St. Regis Bloody Mary. Although the origins of popular cocktails are generally disputed, most people agree that the St. Regis in New York City is the American birthplace of this signature cocktail, which they call the “Red Snapper”. Credit goes to Fernand Petiot, a Frenchman who became head bartender at the St. Regis Hotel in 1934 and brought with him the drink that he created while working at Harry’s New York Bar in Paris in the early 1920′s. I’ve read that the original Red Snapper recipe did not contain horseradish — but this one definitely did, and if you like a Mary that packs a punch, you’ll love the St. Regis Bloody Mary. Each St. Regis has their own signature local Mary and the St. Regis Monarch Beach’s is the Agave Maria with tequila as the base spirit. 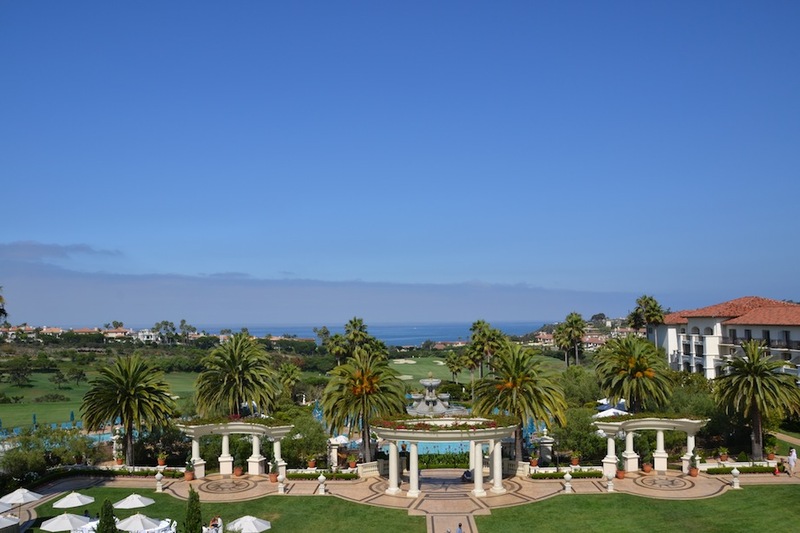 Located in Monarch Beach in Dana Point, you won’t find a more alluring choice than St. Regis’s European-style Motif for elegant oceanfront dining with true flair. 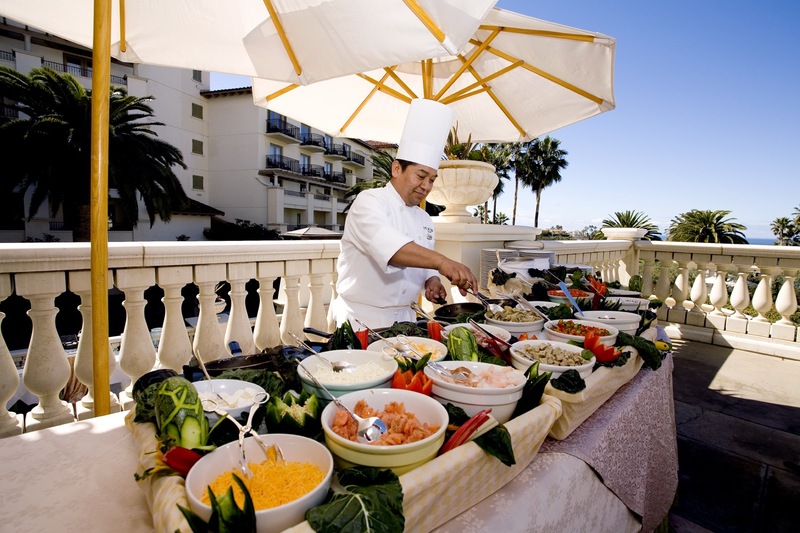 Popular in Orange County for its Sunday Champagne Brunch, Executive Chef Frederic Castan offers a unique culinary experience featuring an array of eclectic international dishes in a warm and inviting atmosphere. Motif offers striking Pacific views for both terrace and indoor dining and lively weekend entertainment. 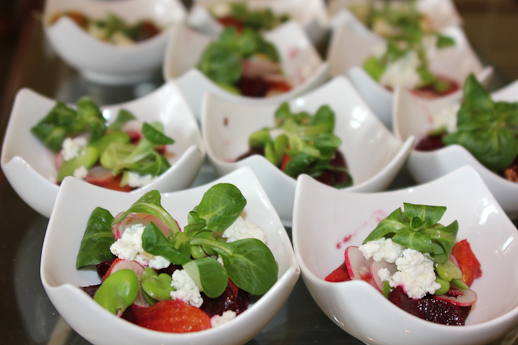 The brunch menu changes to reflect the seasons and the freshest ingredients available locally as well as Chef Castan’s creative touch. Staples of Motif’s Sunday Champagne Brunch are the carving station, seafood station with fresh crab, shrimp, and oysters in the half shell with changing ceviches, gourmet selections of salad, an impressive sushi bar, an Asian BBQ and wok station, and the omelet and pancake station with toppings that stretch as far as the eye can see. 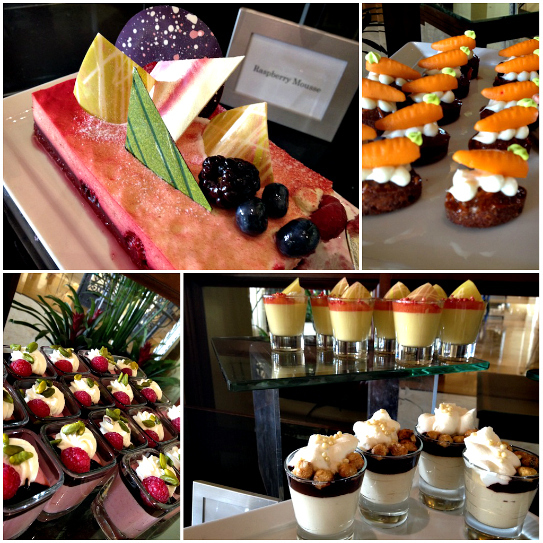 Fortunately, the amazing array of desserts are strategically placed near the entrance so guests know to save room and can contemplate what sweet delicacy(s) to choose as a grand finale to this royal feast. My strategy to avoid pure gluttony at a buffet brunch of this caliber is to choose what I love most: egg dishes, salads, and seafood, and select carefully from the rows of elegant silver servers. On this day, I chose the Achiote marinated duck breast with orange quinoa and crisped sage and it was outstanding. Motif utilizes classic round chafers which are smaller than the more common rectangular servers and hot foods are brought from the kitchen in small batches to maintain quality. This well thought-out approach also allows for maximum enjoyment from the stunning array of decadent dessert delights that await. Of course, if you possess an obsession for the sweet things in life, there’s nothing that says you have to save the best for last! As you can see, I managed to exercise some restraint! What better way to celebrate a special occasion; whether a birthday, visiting family, bridal shower, or treating yourself to a rejuvenating day by the sea. Have a fabulous weekend and remember Easter, Mother’s Day, and Father’s Day are just around the corner! Edit 6/19/16: The St. Regis Monarch Beach debuted June 1, 2016 as Monarch Beach Resort following a $40 million renovation. This month, Mediterranean brunch menu features flavors from Greece with a coastal influence that befits the resort’s seaside location. Photos of property courtesy of the St. Regis. Kitchen Aid with White on Rice Couple, Cristina Ferrare + Joy the Baker! Thanks for the article. 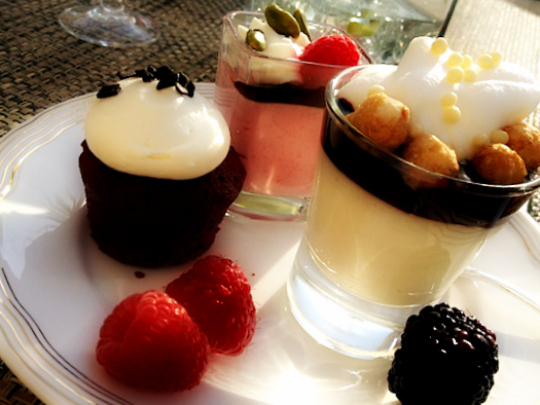 I love the brunch at St. Regis. My favorite occasion for Brunch is Mother’s day. My favorite reason to go to brunch is to take my mother out – there’s never a bad sunday to take mom out and we all know she deserves it – everyone’s mom does. Any occasion is a good occasion for brunch. I rarely get out for breakfast/brunch so it’s always special to be able to go anywhere. Mother’s Day is a great occassion for Brunch. I get to eat, enjoy time with my family and I don’t have to clean up. Mothers day of course!!! Too bad it’s almost next to impossible to get a seat on that way without prior reservation way in advance. Looks amazing! I can’t wait to try it out. Like she’s cookin on Facebook. When family visits from out of town, we all get together for a leisurely Sunday brunch. I wish they’d visit more often, so I could sample more delicious goodies. Fantastic job with this post. Beautiful photography. The sushi one was pretty sweet. I could certainly do some serious damage there. Sunday Funday!! 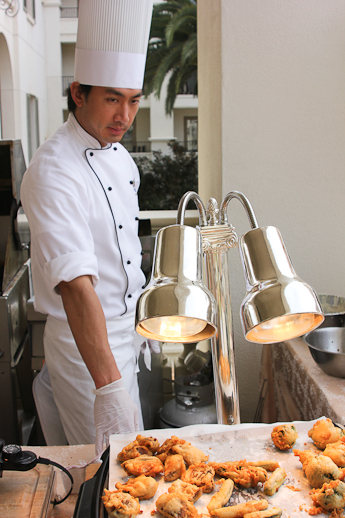 Any Sunday is a great excuse for brunch at the St. Regis! Ilove sitting on the patio drinking champagne, listening to the live music and enjoying tons of delicious food!! My favorite occasion for brunch is Mother’s Day! It’s a perfect way to show your mom or wife how much you care! I like both Facebook pages! I wish I could leave the best time to have brunch, but a brunch this nice is any time of the year worthy. Brunch with the entire family for Mother’s Day is an awesome way to spend a Sunday! My husband and I absolutely LOVE, LOVE St.Regis period. We recently got the Starwood Amex so we can enjoy it more often. The brunch is so amazing and we love to celebrate our anniversary there because that’s where my now husband proposed. We love going out to brunch, especially in April to celebrate the end of tax season. Love the photos! I want to jump in my car right now and head to the St. Regis for brunch. My favorite occasion for brunch is the time between 10 AM and 2 PM. Awesome post and great pics, Priscilla. Sunday Brunch is a long honored tradition in my family. Being newly married, it now also means the joining of two families and two cultures over a delicious feast. What better way to keep our bonds strong, than to feed our stomachs and enjoy good food and conversation. A family reunion is a great occasion for a brunch. Love the site! Mother’s Day is our favorite occasion to do brunch. My husband and I travel home to see our family’s for Mother’s Day weekend and we always get everyone together and go for brunch. It’s a great way to spend time together and celebrate all the moms in our families. My favorite reason to go for Sunday brunch is with my daughter. We enjoy going to brunch a lot for our “mommy-daughter” time. My favorite occasion for brunch is when I get a chance to have a family gathering. Nothing better than sharing good food and laughter with my family. Liked the St. Regis and She’s Cookin’ pages on Facebook. I actually not just like St. Regis and She’s Cookin’, but I LOVE you both. This is such an awesome giveaway! Great post and giveaway! I have to pay the South land a visit soon! This brunch looks amazing, a great selection of both savories and sweets! My favorite occasion for brunch is anytime I crave for good food and a relax time on weekend. Brunch is best with family and friends. During the week it seems every morning is so rushed and hustle bustle. However of the weekends brunch is relaxing, chill, and quality time with the ones you LOVE. Sunday-Funday relax before Maham Monday….is the best reason for brunch! I would LOVE to go to the St. Regis brunch!! It looks Ahhhhh-mazing!!! 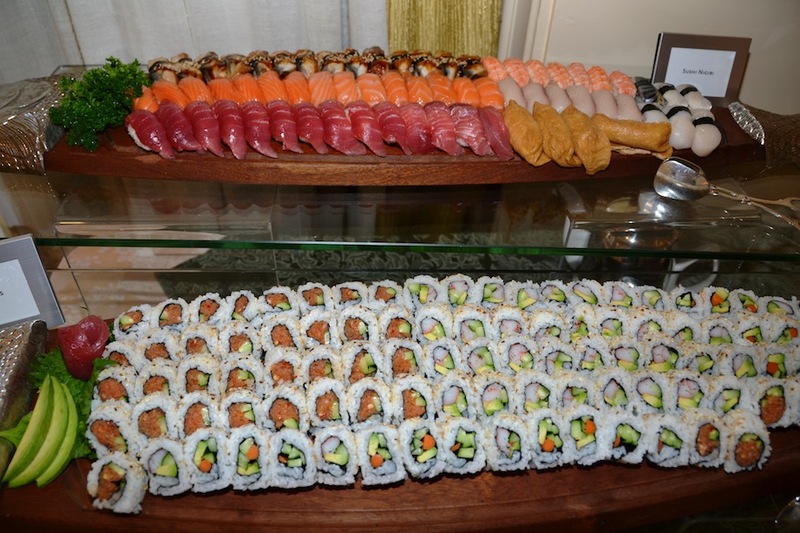 Now, that’s my kind of brunch…what an amazing selection!!! 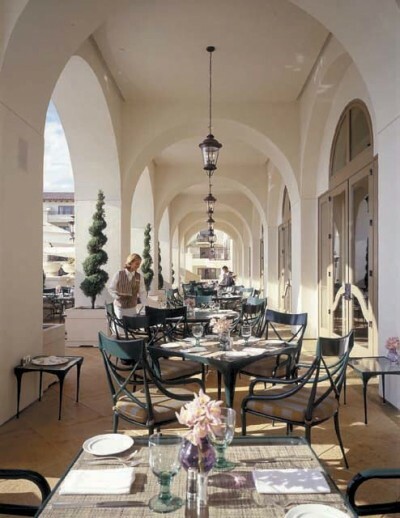 The St. Regis brunch is our favorite place to go. We’ve celebrated it as a Valentine’s treat, birthday, Mother’s Day and for my Mother-in-law take her there as one of her Christmas presents. She loves it! And too cute always wanting to stroll around the property afterwards. Best we’ve ever had!! I can’t wait for Sunday to come so I can go to brunch! No occasion necessary! Just Sunday fun day! My children treated me to Sunday brunch for my birthday. It was wonderful. My children, my grandchild, and my mother were there. It was a four generation family treat, spanning more than 8 decades of family members. I have to say it surely is the best Sunday brunch in the southern california area. Most of all, thank you for a great family memory! 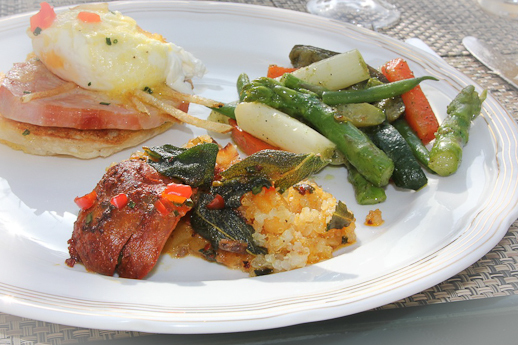 I tried this brunch once before, and was extremely impressed ! I raved about it to so many people we did it again! So glad you enjoyed it, Conrad. Thanks for stopping by and leaving a comment! Love the Brunches during Christmas time. We celebrate both of our birthdays Nov/Dec with a day at the St. Regis Sunday Brunch with all the Christmas decorations. Absolutely beautiful and the food is to die for. Love it!! !